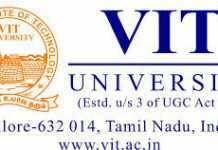 VIT UG 2019- The Vellore Institute of Technology offers admission to the undergraduate courses for the academic year 2019-2020. The courses offered are BBA/ BCA / B.Sc. (Computer Science) / B.Sc. Multimedia and Animation/B.Com/ B.Sc. Catering and Hotel Management. The candidates who are interested can fill the application form from the official website when it will be available. There will be counseling/interview for the admission to these courses and the mode in which information is conveyed is online. The Candidates will learn in this article the important dates for VIT 2019 for undergraduate programs. Admission and other details such as Educational Criteria, Age Criteria, How to apply for, VIT 2019 Admit Card, VIT 2019 Result, VIT 2019 Counselling, Documents to be sent along the application form etc. Latest: The eligibility criteria and application procedure are out now. You may go through the details from below. Eligible candidates can apply for VIT Under Graduate Admission 2019 from the official website i.e www.vit.ac.in or from the direct link which we will also provide you here on this page. Candidates can check the schedule of VIT Under Graduate Admission 2019 from the table given below. B.Sc. Computer Science / BCA A candidate must have a minimum of 70% overall aggregate in Higher Secondary Examination conducted by the State/Central Board of Secondary Education or its equivalent examination in any stream with Mathematics as one of the subjects. B.Sc. Multimedia and Animation A candidate must have passed Higher Secondary Examination conducted by the State/Central Board of Secondary Education or its equivalent examination or have a Diploma (10+3) in any stream with a minimum of 70% overall. B.Sc. Catering and Hotel Management A candidate must have passed Higher Secondary Examination conducted by the State/Central Board of Secondary Education or its equivalent examination. B.Com. (Bachelor of Commerce) / BBA (Bachelor of Business Administration) A candidate must have a minimum of 70% overall aggregate in Higher Secondary Examination conducted by the State/Central Board of Secondary Education or its equivalent examination. And the Student must have studied Commerce / Accountancy / Mathematics as one of the subjects. Candidates hailing from Jammu & Kashmir and the North Eastern states of Arunachal Pradesh, Assam, Manipur, Meghalaya, Mizoram, Nagaland, Sikkim, and Tripura. VIT UG 2019 Application Form will be available to fill online or candidates can also get it from the Prospectus and the information brochure for the UG programmes – 2019, along with the necessary enclosures. The application form will be available on the official website. Candidates are required to enter all relevant details along with the necessary documents required to attach with the application form. Before filling the application form, candidates must ensure their eligibility. Candidates can apply through online at www.vit.ac.in through Net banking/Debit card/Credit card/Paytm mode. Pay the application fee Rs.500/- through online mode using net banking/Debit card / Credit card/Paytm mode. Enclose the required documents along with the application form and send the hard copies to the address of Director-UG Admissions, Vellore Institute of Technology, Vellore – 632014, Tamil Nadu, India. The following documents are required to be enclosed with the application form. Otherwise, your application form will be rejected. The VIT 2019 Admit card for undergraduate courses will be available for those candidates who fill the application form completely within the span of prescribed time. The admit card will be downloaded from the official website of the Vellore Institute of Technology at www.vit.ac.in. The admit card will be issued one week before the exam. The candidate must check the site regularly for the availability of the admit card. The admit card will have to take along on the day of the examination. The candidates who will appear for the exam will be able to check the result for VIT UG 2019 on the official website at www.vit.ac.in. The students will be informed when the result will available on the official website or candidates will also be provided by the direct link on this page. The VIT result will be announced after the exam. Soon after the exam result, there will be counseling which will begin in order to complete the admission process. The Candidates will have to participate in the VIT Counselling process for the purpose of document verification. 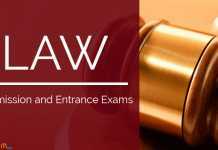 The cases where the candidate fails to produce any of these documents, he/she shall be disqualified for admission. Candidates will be allowed to choose their choice of campus. This will the sole process, therefore the candidate shall not request for admission through any other mode. He/she has to participate in the counseling if they want to take admission. Nativity Certificate (For candidates hailing from Jammu and Kashmir and the North Eastern states of Arunachal Pradesh, Assam, Manipur, Meghalaya, Mizoram, Nagaland, Sikkim, and Tripura). Affidavits towards Academics and Hostel on Rs.20/- non-judicial Stamp Paper. Two photocopies of all original documents. (Except Affidavits / Physical Fitness Certificate / Student Profile). Insofar, only the eligibility criteria and application procedure for VIT Under Graduate Admission 2019 is out. Rest of the information is as per the last year. When the further details will release, we will update the details as soon as possible.